Inert training cartridges developed for training or instructional activities require use of a dummy cartridge. 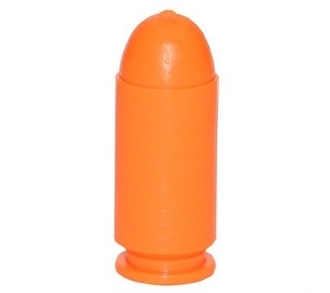 Manufactured from a durable synthetic material and colored "safety orange" for instant identification, Saf-T-Trainers provide safety by greatly reducing the risk of live ammunition and dummy cartridges from becoming mixed during training exercises. An affordable replacement for traditional metallic dummy cartridges. Saf-T-Trainers will also cushion the firing pin when used as a snap cap.